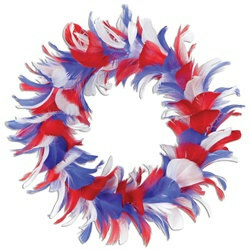 Show you patriotism this 4th of July by decorating your door with this Red, White and Blue Feather Wreath. The Red, White and Blue Feather Wreath is a great decoration for hanging from doors or walls to show your red, white and blue support. Pair this Red, White and Blue Feather Wreath with other red, white and blue decorations to complete the color scheme. Each package includes (1) Red, White and Blue Feather Wreath measuring (12) inches.